Litigation is always on the move and under reform and June saw The Modern Litigation Trends conference hosted in Manchester. Featuring insights from experts and key note speakers, the event was chaired by Brabners’ Jeff Lewis, renowned litigator and head of litigation, Manchester, who provided thought-provoking questions in the Q&A and discussion. With a focus on the year ahead, future trends and the evolution of the institutional third party litigation funding market, the attendees also got the view from the bench from His Honour Judge Bird spoke about some of the most important pilots that are soon to be rolled out within the next year or so and the importance of the role of legal advisers in the future. “The changes ahead are designed to improve access to justice.” – His Honour Judge Nigel Bird – Designated Civil Judge. And from Professor Dominic Regan, who emphasised the need to ensure that we are continuously following the reforms whilst providing an in-depth view of what we should be looking for and the potential dangers of the market. “There is a duty today for litigators to be constructive and cooperative. Conduct is a massive theme out there today... people need to keep up-to-date.” – Professor Dominic Regan, Key Note Speaker. 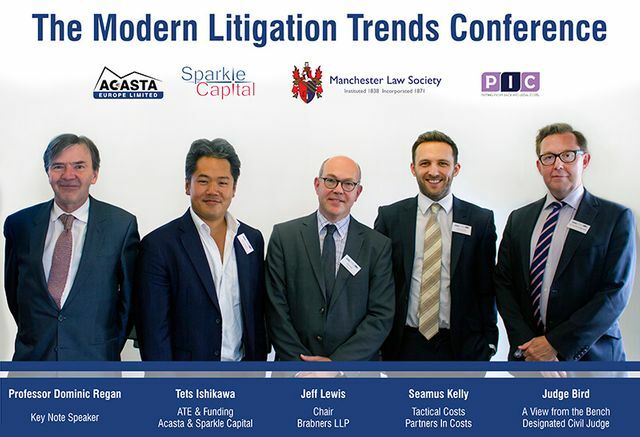 The Modern Litigation Trends Conference came to Manchester in June 2018 where Acasta partnered with the Manchester Law Society, PIC, and Professor Dominic Regan to bring you the latest updates in the market. The event was chaired by Jeff Lewis a renowned litigator and head of litigation at Brabners LLP. Jeff provided a keen interest and thought-provoking questions in the Q&A. We’re looking forward to speaking at the Modern Litigation Trends Conference with @AcastaEurope @ManLawSoc this morning and hosting the @AvMAuk Curry Night in London this evening!